International automotive supplier Continental has been developing and manufacturing anti-lock systems for motorcycles for more than 10 years. 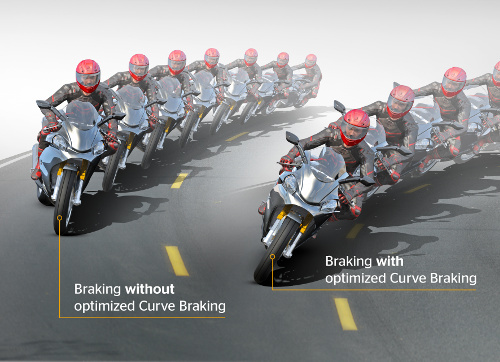 The German company has now enhanced its Motorcycle Integral Brake (MIB) system by adding a new function: optimized curve braking for safer braking in curves. "Thanks to optimized curve braking, braking in curves is more stable and therefore more predictable. The danger of having an accident in a curve is reduced and safety is increased," says Ronan Le Roy, head of the motorcycle business in the Vehicle Dynamics Business Unit of Continental's Chassis & Safety Division. 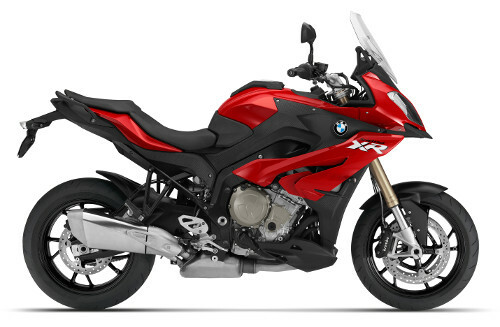 The function will go into series production in the new BMW S 1000 XR motorcycle in early summer 2015. Up until now, Anti-lock Brake Systems (ABS) for motorcycles have been designed to maintain stability during straight-line braking. Brakes must be applied carefully in curves in order to avoid an abrupt fall. "The system takes account of the fact that a motorcycle banks in curves. The ABS kicks in more gradually, modulating braking pressure more smoothly to improve handling in curves," says Lothar Kienle, head of Development Motorcycle in the Vehicle Dynamics Business Unit. The Motorcycle Integral Brake system makes sure that brake pressure is applied to both the front and rear wheel in ideal proportion. The result is greater overall stability. The motorcycle translates a rider's braking intention without a radical shift in weight -- a prerequisite for dynamic handling and enjoyment coupled with a reassuring sense of safety. The optimized curve braking relies on the interaction between numerous sensors and high-capacity algorithms that comes together in the Continental Sensorbox, a modular concept that comprises up to six degrees of freedom (6DoF). The yaw rate, the roll rate, and the pitch rate are measured in a scalable range up to 300 deg/sec. The acceleration is detected in longitudinal, lateral, and vertical direction. Based on the sensor signals and motorcycle-specific characteristics, the roll angle of a motorcycle is calculated. The pitch angle can be calculated optionally. The ABS adapts as a function of how much a rider leans into a curve, depending on the situation. The sensor cluster provides signals on roll and pitch rates plus lateral acceleration to help determine the angle at which a rider is leaning and checks the data around 100 times per second. As the rider leans more into a curve, the system further limits the speed of the brake-pressure increase at the beginning of braking. The resulting braking pressure accumulates gradually. In addition, the ABS doses modulation more gently. Advantages of the optimized curve braking result in a more sensitive response, greater stability, and optimum braking, even in curves for the driver. Particularly sensitive lift-off detection of the rear wheel for optimum deceleration and stability (Rear Wheel Lift-Off Protection, RLP). Electronic traction control (Traction Control System, TCS) steps in whenever a motorcycle appears on the verge of getting out of control due to excess speed, extreme banking, or too much slip. Motor management and/or braking reins in power so that a motorcycle can regain stability. Wheelie control regulates engine torque to prevent the front wheel from lifting off during acceleration. Anti-lock Brake Systems are just as important to motorcycles as they are to cars so that a vehicle remains stable under emergency braking, the front wheel continues to turn, and the motorcycle does not come to an abrupt fall. "Studies have shown that equipping motorcycles with ABS could reduce accidents by 20 to 30 percent," says Le Roy. "Universal use of ABS in motorcycles and scooters could greatly reduce the number of serious injuries and accidental deaths." ABS will become mandatory for motorcycles with more than 125 cc displacement starting January 1, 2016, for newly developed models, and January 1, 2017, for any new motorcycle sold in the European Union (EU). The aim is to give motorcyclists more stability, more control, and a big safety plus. Continental is supporting manufacturers and riders with an array of solutions for every class of vehicle. The lineup extends from simple one-channel ABS for scooters and light motorcycles to the Motorcycle Integral Brake system that also offers such enhanced features as sport and off-road ABS, optimized curve braking, or Motorcycle Hold & Go, which provides active support for the motorcyclist when driving off on an incline. Further information on electronic brake systems for motorcycles can be found here. Copyright © 2015 by Nelson Publishing, Inc. All rights reserved. Reproduction Prohibited.